For U.S. cooks, south-of-the-border recipe inspiration is too often relegated just to Tex-Mex cuisine. Nothing wrong with it, but it's cool to note that there's a slew of other food styles and flavors from the Mexican culture. Cut avocados in half and remove the seed and scoop out the flesh. Put in a blender with about half othe cram and process until smooth. Add rest of the cream. In a saucepan, heat the chicken stock to a boil. Remove from heat and whisk in the avocado-cream mixture. Season with salt, cilantro, hot sauce, sherry, and then re-heat gently until just warmed through. Do not boil. Serve topped with a little crushed red pepper. Drain beans and rinse under cold water. In a large pot, bring the water to a boil and add beans; boil 10 minutes. Reduce heat, cover and simmer about 2 hours, along with the onion, garlic, salt, cumin and chili powder. About 30 minutes before serving, adjust seasoning. Puree. To serve, sprinkle each bowl with some of the queso. 1 (15-ounce) can whole tomatoes (unless it's summer and you can get 3 fresh ones: remove the seeds, peel and chop). Melt the butter in a large saucepan. Add the onion, garlic and corn; cook about 5 minutes until the onion starts to get soft (but not browned). Add 2 tablespoons of the cilantro, the tomatoes, chicken broth, bay leaf; bring to a boil, then cover and simmer about 30 minutes over reduced heat. Remove the bay leaf, then puree the soup. Return to the saucepan and stir in the half and half. Do not boil. To serve, top with remaining cilantro. Need a cow? Or if that’s overwhelming, half a cow? Or a quarter of a cow, fed naturally on grass. Marx Foods, an online specialty food company, has added portions of beef shipped directly from the ranch in Eastern Washington where it was raised at Eaton Natural Beef. Eaton’s cows are are kept on the ranch to forage on their natural diet. The animals are never treated with hormones or growth-promoting additives. They live natural lives and are not treated with antibiotics or other drugs. Smaller quantities of New Zealand-raised, Dunedin grass-fed beef is also available. Cut and size options are available in 10- to 40-pound boxes. A whole beef is approximately 400 pounds of meat, a half 200 and quarter 100. Typically, a mix of 50 percent hamburger, 25 percent roast and 25 percent steak cuts are wrapped in portion size packages, flash frozen and shipped overnight. Stew meat, brisket, ribs and cubed steak are also an option. Quarter, halves and whole beef are $6.14 per pound. Dunedin beef is available in 10 to 40 pound boxes with a choice of cut and size and will be shipped overnight. Call (866) 588-6279. Because grass-fed beef is so lean, it’s best for rare or medium-rare cooking. If cooked like conventional beef, it may become tough. For best results, use a meat thermometer and cook to an internal temperature of 150 degrees Fahrenheit for medium or 140 degrees Fahrenheit for medium-rare which will generally take about 30 percent less time. On Wednesday the Hershey Company unveiled of a replica of a fan photo mosaic during the Dale Earnhardt Day celebration in Mooresville, N.C. Bearing Earnhardt’s likeness, the 6-foot-tall, 8-foot-wide mosaic is comprised of some 1,400 photos from fans across the country, including actress Carmen Electra, racing teamowner Richard Childress and drivers Mark Martin and Mark Truex Jr. The mosaic will serve as a permanent tribute to “The Intimidator” at Dale Earnhardt Inc. headquarters in Mooresville when completed later this year. 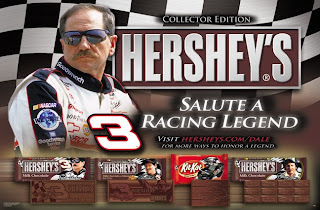 Hershey is paying tribute to Earnhardt with a series of Collector Edition Dale Earnhardt chocolate bars. The bars feature an on-bar design, including Earnhardt’s signature and stylized #3. No word on whether the bars can draft -- or run four wide at 'Dega. Hershey is also encouraging fans to honor the racing legend by inviting them to upload a photo for inclusion in the permanent mosaic and to make a donation to The Dale Earnhardt Foundation. Fans can still upload their photos and tribute messages through June 3 for inclusion in the final mosaic. Available in four varieties, the bars include three individual portraits spanning Earnhardt’s distinguished career and one image of the Richard Childress Racing #3 car that is most synonymous with Earnhardt’s nickname, “The Intimidator.” Packaging features facts about Earnhardt's life on and off the race track and are redeemable for Dale Earnhardt merchandise, such as a #3 soft-sided cooler or a poster designed by motorsports artist Sam Bass. Dan Whisenhunt is there as JSU president Bill Meehan's interview begins at Valdosta State in Georgia. (Meehan is in the running for the president's job there.) Dan looks at the similarities between the two campuses - they have a lot in common, from size, to scope of programs and history. Todd South reports on the "state of the school" address given in Oxford by schools superintedent Jeff Goodwin. Cleburne County tops a state tourism report on the percentage increase in tourism-related jobs. Andy Johns looks at the numbers and how Cleburne County's tourism industry has grown in recent years. Jacksonville residents will gather for the first public forum about the strategic plan resulting from the city's drive to be labeled an "Alabama Community of Excellance." Matt Kasper has this story. From the folks at Real Age comes this tip on a quick smoothie. Tart apple and spicy cinnamon can sure get your taste buds tapping. But help control your blood sugar, too? It very well might. Turns out that a daily dose of cinnamon may help improve insulin receptivity -- an important part of blood sugar control. Slip a little more cinnamon into your day with a Double Apple Cinnamon Smoothie (recipe below). You may need only a little bit of cinnamon -- as little as a quarter teaspoon a day -- to reap blood sugar rewards. Just don't overdo it -- highly unlikely with a typical diet, but loading up via supplements could be toxic. Another cinnamon bonus: When you add it to high-glycemic-index foods, it can help lessen their impact on your blood sugar. This cinnamon-inspired smoothie recipe is brought to you compliments of the YOU docs -- Mehmet Oz, MD, and Michael Roizen, MD -- and their newly updated and expanded YOU: The Owner's Manual. To be sure you get enough cinnamon -- this recipe serves two -- we suggest topping your drink with a generous sprinkling of the fragrant spice. Combine all ingredients in a blender. Cover; blend at high speed for 1 minute. Pour into frosty mugs, if desired, and top with powdered cinnamon. Nutrition information (per serving): 204 calories; 3.4 grams fat (1.3 grams aging fats); 5.6 milligrams cholesterol; 34.9 grams carbohydrate; 9.1 grams protein; 2.7 grams fiber; 266 milligrams sodium; 566 milligrams potassium. By the way, I finally finished off my wonderful vegan toothpaste this weekend. We buy bread at the bakery outlet and stock the freezer with the loaves. Saves about 66 percent on our bread cost. I feel older today. Not so much because of aging or anything like that, but yesterday felt like a birthday for me. I went with my wife, brother, and a friend to the Huntsville Stars minor league baseball game and we stopped at the legendary Big Bob Gibson's Barbecue in Decatur on the way home (sort of). What a perfect day. It felt like we were celebrating. I had high hopes for every thing I had heard about Bob's. I had gotten an email last week hailing Bob's at the best in the state or world or universe or something. I had read about it in my BBQ USA book by Steve Raichlen, where he hailed Bob's white sauce. I had seen it featured on a barbecue show on either PBS, Travel or Food. The white sauce was different, but good. It had a strong, pickle/mustard taste to me, and my group decided it was best on chicken. I got the sampler plate with smoked turkey, pulled pork and chopped beef brisket. The turkey was good with a nice spicy rub on the outside, but it was light on smoke and a long way from the turkey at Sconyers in Augusta, Ga. The brisket was the best thing on my plate and it was flavorful, but dry. The pork was just there. Not very smoky, no real taste to it until I poured on the red sauce, which was a spicy and not overpowering, but nothing unique. Overall I was disappointed big time. Maybe we caught them on a bad day or maybe it isn't what it used to be. At least I can say I've been. Breakfast isn't just for breakfast, you know. The day-starter can also be a day-ender. Several years ago, we ran across these in Rhode Island at a place called Jiggers Cafe. In a large bowl, stir the coffee and sugar until the sugar dissolves. Beat in the egg and butter. In another bowl, mix the dry ingredients, then stir the dry mix into the "wet" bowl until just blended. Don't overmix; it makes you pancakes tough.Cook on a hot griddle. (If you must have a dinnertime feel, these pancakes make a great base for spicy pulled pork barbecue. According to a 2007 Information Resources, Inc. Consumer Snacking Study, nearly two-thirds of us skip or multitask (horrible word, that) during lunch. However, skipping lunch is doing Americans far more harm than good. While the majority of us are trying to eat healthier, overlooking this important source of midday energy can lead to unhealthy snacking, overeating at dinner, and decreased productivity in general. On the other hand, a food break around noon reenergizes the body and gives the mind a moment of rest. Four simple changes to the daily routine will improve midday eating habits, and save money from having to eat out every day. Pay Attention to Portions: Research from the National Center for Chronic Disease Prevention shows that portion sizes have increased in the past two years, with people inadvertently consuming more calories when faced with larger portions. Check out the serving sizes when purchasing reduced fat foods and ensure you aren’t getting more than you expect. Snack Smart: Bring healthy snacks to eat throughout the day. If you tend to snack at home, cut up and refrigerate snack-sized portions of your favorite healthy foods so they’re just as convenient as the calorie-rich packaged snacks timecrunched consumers may gravitate towards. Ham and Swiss with a twist. Spread each focaccia half with honey mustard. To assemble each sandwich, place, 1 focaccia half, mustard-side up onto serving plate. 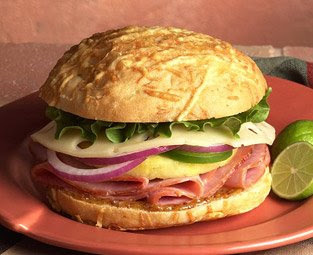 Top with 2 slices ham, 1 pineapple ring, 1 pepper ring, 1/4 onion rings, 1 slice cheese and 1 lettuce leaf. Top with remaining focaccia half, mustard-side down. I am ashamed to say that despite my enthusiasm for grilling and my skill with steaks, vegetables, deserts and pork on the grill and smoker I have never been able to make a good hamburger ... until this weekend. The last time I made (crumbly) burgers I talked with Laura about them and she theorized that I was doing to much. As is turn out, I was. I had been taking the ground beef and mashing it up with spices and rubs and BBQ sauce and then watching the burgers fall apart or morph into meatballs over the fire. This time, after her motivational talk, I took the 90-percent-lean beef in the tray (a little over a pound) and broke it into four sections. I then gingerly patted the beef into round patties, hit them with a few shakes of pepper, a shake of BBQ spice and a few drops of liquid smoke. When I cooked them I put them on the bottom rack for one flip and them moved them to the top rack while I grilled the corn, cooked the beans and grilled steak strips for fajitas. BAM! Perfect hamburgers. I was way over-doing it all along. The moral of the story: Less is more, and Laura knows all. Naturally, the food folks who make ready-made deli lunches want to capitalize on that trend. A recent survey found that nearly 40 percent of Americans say they eat lunch hunched over a keyboard, which is in stark contrast to the 11 percent who regularly venture out for their mid-day meal. Hence, the new sandwiches – Buffalo-Style Ranch Chicken, Chicken & Bacon Ranch, Sun-Dried Tomato Chicken, Fajita Beef & Salsa and Steakhouse Beef with Garlic Parmesan sauce. 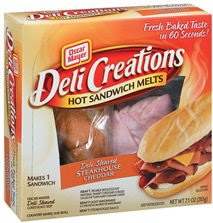 Available nationwide in May 2008, Oscar Mayer Deli Creations Flatbread Sandwiches can be found in the refrigerated meat case section and have a suggested retail price of $2.99. Oscar Mayer Deli Creations Flatbread Sandwiches are a new addition to the product line which also includes Oscar Mayer Deli Creations Sub Sandwiches, available in five delicious varieties – Turkey & Cheddar Dijon, Oven Roasted Ham & Cheddar, Honey Ham & Swiss, Steakhouse Cheddar and Turkey Monterey. G.L. Mezzetta, Inc., a producer of imported and domestic peppers and olives, is challenging sandwich aficionados across the country to submit their recipes for the best sandwich ever. Ever. A good suggestion would be the sandwich here that uses peppers, serrano ham and provolone cheese. The Grand Prize winner of the Mezzetta Make That Sandwich Contest will receive $25,000 and a culinary trip and tour to Napa Valley, home of Mezzetta. Three runners-up will get $1,000 each. The requirement is to use at least two of Mezzetta's savory gourmet ingredients, such as Hot Cherry Peppers, Tamed Jalapeño Nacho Rings, or Peperoncini. "This contest officially marks the end of the boring sandwich," explains Jeff Mezzetta, president. 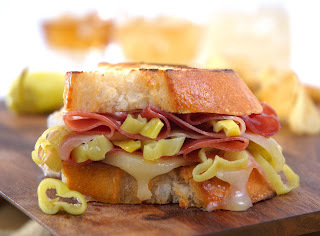 "Mezzetta products add flavor so easily there's no reason to ever eat another bland sandwich." Mezzetta was founded in 1935 in San Francisco's North Beach, and is considered part of the unique culinary heritage of the Bay Area, much like Dungeness crab and sourdough bread. Giuseppe Luigi Mezzetta, an Italian immigrant, began his business selling imported Italian specialties to North Beach markets. Four generations later, the company is still family owned and operated and still producing great flavor-charged ingredients including their best-selling item-and one of the most popular sandwich toppers ever-peperoncini. Contestants can enter the Mezzetta Make That Sandwich Contest in any or all of four categories: cold sandwich, hot sandwich, vegetarian, and hero (submarine-style). The Grand Prize winner will be selected from the category finalists by a panel of culinary experts. Entries will be judged on appearance, taste, creativity, and use of Mezzetta products. The contest begins May 26 (Memorial Day) and ends September 1, (Labor Day) 2008. A new Web site introducing the Mezzetta Gourmet Sandwich University, launches today and features complete contest rules, a compendium of sandwich lore and information, and an electronic entry form. But who'd volunteer for such a contest? The American Egg Board has launched its second "Search for America’s Worst Cook," a contest (of sorts) stemming from a survey that says 50 percent of Americans report having kitchen disasters regularly. Don't know that I believe that one, but read on. Apparently the Egg Board is looking for people whose recipe repertoire consists of microwaveable meals and the phone number for a pizza delivery guy. Such folks just might be America’s Worst Cook. According to the second cooking survey from the American Egg Board, 50 percent of Americans reported having a disaster in the kitchen at least several times a year, and 42 percent said they know someone in desperate need of basic cooking skills. Overall, more than three-fourths of Americans (78 percent) believe that people today are worse cooks than people were 50 years ago. Howard Helmer, the Guinness World Records "World's Fastest Omelet Maker," wants to help by encouraging home cooks of all ability levels to embrace the kitchen and take the spatula back into their own hands. Many Americans are worried about their wallets getting thinner, and with more than 70 percent of meals being prepared at home in 2007, the egg folks say it's a perfect opportunity for families to spend more time learning how to make easy, affordable and delicious dishes. Helmer believes that even the worst cooks can master easy egg dishes. "I'm famous for my record-breaking omelet-making speed, but omelets are just the beginning when it comes to simple egg recipes. Even a novice can create an elegant quiche, frittata, or a strata casserole, and all it takes is a positive attitude, some patience and almost anything you have in your refrigerator or pantry," Helmer says . Helmer recommends home cooks try Fool-Proof Frittata or Simple Strata for an effortless and enjoyable cooking experience. "These dishes are so easy to make that the entire family can lend a hand. Even kids can help by cracking and whisking eggs, and sprinkling and stirring fillings," Helmer says . "And, moms can feel good about serving up eggs because they provide one of the highest-quality proteins of any food available." The contest starts today and runs through June 30. But if you're going to San Fransisco -- or anywhere else on the West Coast -- here are some wines to check out for Oysters and Wine, par excellence. To wit, the winners of the 2008 Pacific Coast Oyster Wine Competition's 12 best West Cost wines for Oysters. The restaurants that hosted the judging sessions probably are pretty good, too. In final judgings at the Water Grill in Los Angeles, Sutro’s at the Cliff House in San Francisco and Anthony’s HomePort in Seattle, 40 food and wine writers and restaurateurs selected 12 winners of the prestigious “Oyster Award” as the conclusion to the month-long, 14th Annual Pacific Coast Oyster Wine Competition, the annual dating service to find the best West Coast matches for oysters. Seven California, three Oregon and two Washington wines, including nine crisp Sauvignon Blancs, two bright, refreshing Pinot Gris and one Pinot Blanc, prevailed over a record 200 entries in the first competition to judge a wine by how it goes with a food. All wines are blind tasted with Kumamoto oysters in the four-tier judging process. Few wines go with oysters, a vibrant combination of minerals, sweetness and the sea. That is why the competition identifies, on an annual basis, a group of great “oyster wines” that restaurants can offer with oysters on the half shell, an increasingly popular menu item. The competition is organized by its founder, Jon Rowley. Taylor Shellfish Farms invited British Columbia, California, Idaho, Oregon and Washington wineries to submit their best “oyster wines,” typically dry, crisp, clean-finishing white wines. Each wine is blind tasted with a Kumamoto oyster. The judge first smells and then chews the oyster well, then smells and tastes the wine, then rates the “bliss factor,” the wine’s affinity with the oyster. The finalists were judged, again with oysters, by 12-14 judge panels in the three cities. Because of the number of wines that impressed the judges, two additionl “Oyster Awards” were awarded this year for a total of 12. Some of the competition judges claim they have the best job in all of food and wine. “I wait all year for this,” says longtime Los Angeles judge, LA Weekly restaurant critic and 2007 Pulitzer winner, Jonathan Gold. Taylor Shellfish Farms, based in Shelton, Wash., is a fourth-generation, family-owned company producing manila clams, Mediterranean mussels, geoduck and oysters for national and international markets. Chuck Hill, Wine Writer; Author; Publisher, "Joy of Oysters"
Richard Kinssies, Proprietor, Wine Outlet; Wine Columnist, Seattle P.I. Children are always looking for ways to help in the kitchen. The trick for busy parents is find something that children can make -- and eat -- that doesn't take all day. That said, the 80th anniversary of S'mores, has rolled around this year. 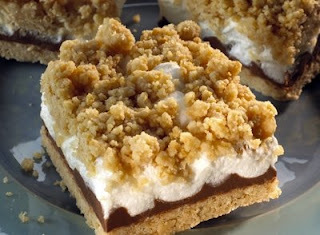 Always a hit, s'mores make a fun snack for everyone. For kids, they're a sweet treat. For parents, it's easy to keep up with a child eating s'mores: just press them to the nearest flat surface, and they'll stick there all day. OK, that last part was a joke. Heat oven to 350. Grease 8-inch square baking pan. Beat butter and sugar until well blended in large bowl. Add egg and vanilla; beat well. Stir together flour, graham cracker crumbs, baking powder and salt; add to butter mixture, beating until blended. Press half of dough in prepared pan. Bake 15 minutes. Sprinkle mini chocolate bars over baked layer or arrange unwrapped chocolate bars over baked layer, breaking as needed to fit. Sprinkle with marshmallows; scatter bits of remaining dough over marshmallows, forming top layer. Bake 10 to 15 minutes or just until lightly browned. Cool completely in pan on wire rack. Cut into bars. A friend at church gave me a fresh batch of sourdough starter yesterday. It's scheduled to "feed" on Sunday, bake on Monday, so I've got to shift the sked on it up a day so I can feed on Friday, bake on Saturday. I've been playing with a whole-wheat starter (the one we published in the Star several weeks ago.) This time around, I'm going to go Mediterranean with the bread and use some olive oil, roasted garlic and suchl, as per the starter donor's suggestion. I've got a 9-inch-by-9-inch stoneware baking dish (unglazed, beautifully seasoned), and I'm going to see if I can make what would best, but inaccurately, be described as a sourdough foccacia with fresh rosemary, parsley and green onions from the garden. A simple lunchtime walk can lead to a lifetime of better fitness. Businesses around Alabama - with a nudge from Blue Cross and Blue Shield - will encourage their employees to don their sneakers at lunchtime on Wednesday, April 30. The occasion is the second annual Walk @ Lunch Day, established to dramatize the benefits of a daily walk and promote a healthy habit. Last year's National Walk @ Lunch Day drew thousands of participants in 46 states, and Blue Cross is hoping it will catch on in Alabama, according to James Brown, senior vice president-customer information services. "It's a great way to spend a lunch hour, it doesn't take a lot of equipment, and it doesn't cost anything. And if you spend your time getting some exercise rather than eating a high-calorie meal, that's just another plus," Brown said. "A lot of people don't realize it, but walking a mile burns about the same number of calories as running a mile." And with companies and individuals alike concerned about rising health care costs, a simple walk daily walk can have a big impact, according to Brown. "The reality is that more than 60 percent of Americans don't get the exercise they need, and that's probably conservative," Brown said. "If people will just try it one day, they'll realize it's a painless, pleasant way to work in some activity, which can help them control their weight, develop healthier hearts, and strengthen their bones. Plus, you feel really good about yourself all afternoon." Agave syrup is juice from the cactus - such as the Mexican Blue Agave plant grown in the volcanic soil around Guadalajara — the same juice that, when fermented, becomes tequila. When it is heated, it becomes a syrup that is not only 50 percent sweeter than sugar, but is also reported to have health benefits. The causes of ADD, which is a recurrent pattern of behavior characterized by short attention spans, impulsivity and may include hyperactivity, are hot topics for debate and speculation as to whether it is environmental or genetic. Sandoval wants the public to consider three possible food-related ADD risk factors; starting with high sugar consumption, “Destructive, aggressive and restless behavior has been found to significantly correlate with the amount of sucrose consumed.” While it may prove difficult at first, his initial recommendation is to eliminate all refined sugars and food allergens from the diet. Additionally, limiting the consumption of processed foods and additives – like food colorings and artificial flavoring – needs to be considered. “In many cases, identifying and eliminating clear causative diet factors will often bring about dramatic improvements within the first few weeks,” exposes Sandoval. He adds that improvements will be more subtle and not as great if food reactions are not the cause of ADD. The body’s storage of heavy metals - particularly the toxic metal lead - has also been linked by studies to childhood learning disabilities. Sandoval recommends screening children for heavy metal poisoning using hair mineral analysis and EDTA challenge rather than blood tests to properly assess the long term affects on the brain. Sandoval offers insight on chelating the heavy metals from the body, “Increase consumption of foods high in sulfur such as garlic, onions and eggs; provided your child is not allergic to them.” Additionally, he prescribes Chlorella and C from Nature, which contains naturally occurring Vitamin C. Sandoval says both are also helpful in combating heavy metal poisoning. To Sandoval, the option to take a holistic route needs to be seriously weighed before resorting to pills that offer a hefty price tag and a litany of side effects, “There is no safer approach to getting well than nature’s approach.” That’s why he offers an ADD Battle Plan – and others including Lupus, Diabetes and Weight Loss Battle Plans – on his website. You don't have to be from Mexico to enjoy Cinco de Mayo (Remember how many non-Irish folks celebrate St. Patrick's Day). Indeed, it can be a perfect time to roll out some authentic Mexican food flavors. Most Cinco de Mayo celebrations in the U.S. revolve around Tex-Mex foods and Mexican libations. There are margaritas, piñatas, mariachi bands, and maybe a sombrero or two. Brightly colored banners proclaim the coming of this much-misunderstood fifth day in May—but do we really know what we're celebrating? Many believe, incorrectly, that Cinco de Mayo is the Mexican Independence Day, like our Fourth of July. But Cinco de Mayo is really the celebration of the victory at the Battle of Puebla in 1861—51 years after Mexico's battle for independence began. Puebla, a small town in east-central Mexico, was the setting for this dramatic battle in which a force of 4,500 lightly armed Mexicans defeated 6,000 well-armed and highly trained French soldiers. Though a popular celebration in the U.S., Cinco de Mayo is more of a regional celebration in and around Puebla, according to Chef Iliana de la Vega, a Latin cuisines specialist at The Culinary Institute of America, San Antonio. Chef de la Vega came to the CIA's newest campus in San Antonio from Oaxaca, Mexico, and will spend her first Cinco de Mayo in the U.S. this May. "I'm excited to see the Cinco de Mayo celebrations here in San Antonio, but this is not as big a deal as our Independence Day celebrations on September 16," she said. "It is certainly a U.S. commercial success but it also highlights Mexican heritage, culture, and food." 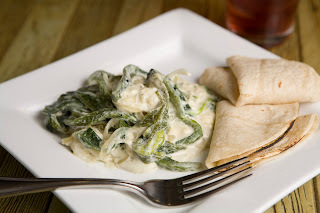 Chef de la Vega's recipes for Rajas Poblanos con Crema (poblano pepper strips with cream) and Caldo de Hongos (mushroom soup) use authentic Mexican ingredients. They are simple, traditional Mexican foods that you might not see on your local Tex-Mex restaurant menus. For the Rajas Poblanos con Crema, Chef de la Vega uses poblano peppers. "Poblanos are mild inexpensive peppers that are easy to stuff, and are available year-round. They are a little spicy, but not too hot. The basic method to use them involves roasting, peeling, de-veining, and seeding them," she said. "When roasting the poblano chiles, be careful not to overcook them. Just roast enough to peel the skins off. For the Caldo de Hongos, you can use white button mushrooms or a mixture of your favorites." Like those who fought in the Battle of Puebla, these traditional Mexican recipes, though simple, can rise above the commercial hype and celebrate the true culinary heritage of our neighbors to the south. Chef Garcia has a video demonstration for Rajas Poblanos con Crema. Make a 1-inch slit on each chile. Heat the oil in a medium skillet. Fry the chiles in the oil, turning them until completely blistered. Set aside to cool. Peel the cooled chiles. Discard the seeds and stems. Slice the chiles. Heat 2 tablespoons of oil in a large sauté pan. Add the onions and sauté for 5 minutes. Add the chiles and sauté for another 3–5 min, until cooked. Add the cream, salt to taste, and bring the mixture to a boil. Just before serving, add the cheese. As soon as the cheese is warm, serve immediately. *Heavy cream may be substituted. **Mild feta cheese may be substituted. Variation: You can add cooked corn kernels. Chef's notes: Serve with hot tortillas, over white rice, or with grilled meat, chicken, or fish. Nutrition information, per 9-ounce serving: 220 calories, 5 grams protein, 16 grams fat, 14 grams carbohydrates, 45 milligrams sodium, 60 milligrams cholesterol, 3 grams fiber. Cut and discard the foot end of each mushroom. Slice each in half lengthwise, and finely slice the halves. In a large stockpot, heat the olive oil. Add the onions and sauté for 2 minutes. Add the garlic and sauté for a few seconds. Add the chiles to taste, and add the sliced mushrooms. Cover the pot with a lid and reduce the heat to low. Allow the vegetables to cook and gently sweat for about 10 minutes, or until softened. Add the broth, and season to taste. Chef and television personality Lorena Garcia will bring her Latina style and cooking culture to Riverchase Galleria in Hoover on May 4, from 2-4 that Sunday afternoon. Garcia will combine elements of her Latin heritage with flavorful and unique ingredients. Garcia will prepare organic cucumber carpaccio with pink peppercorns and crème de papaya, offering samples to those attending the event while supplies last. Garcia was born in Venezuela and is a graduate of Johnson & Wales University Culinary Arts School. She trained in restaurants in Paris, Italy, Japan, Korea, Thailand and China. Garcia has owned and operated two restaurants in the Miami Design District, beginning with Food Café and then later Elements Tierra, a fusion restaurant inspired by flavors she acquired in her travels. Garcia’s background includes hosting a weekly national cooking show on Univison Radio, hosting regular cooking segments on both the Univision and Telemundo television networks, and most recently, a cooking show on international network, Utilisima. Her approach to cooking have landed her on the pages of Cosmopolitan, Vogue, Kiplinger’s and Entrepreneur among other top lifestyle publications. Garcia’s "Big Chef Little Chef" program in which she works with school aged children and their parents to teach them about nutrition and how to cook and eat properly, has been reported on by hundreds of media outlets across the U.S. and Latin America. Directly following the cooking demonstration, Garcia will be available for autographs and to answer questions from the audience. This event celebrates the February 2008 launch of a signature line of Lorena Garcia home products designed exclusively for Belk. The collection includes tabletop, cookware, housewares and fashion bedding. It's exhausting trying to decide if an ingredient calls for a "volume" measuring device or a "weight" measuring device. Give me a 1-cup scoop, anytime. The discussion of U.S. food habits brought to mind a recent story on the Guardian (a British paper) Web site that said: "Spectre of U.S. Food Rationing Looms." Right. The country whose idea of "rationing" means limit two on the 39-cent-per-pound turkeys at Thanksgiving is being portrayed overseas as in penury, "the wolf's at the door." What is happening is that rice suppliers are starting to speculate that the cost of the global food staple is going to spike -- a fact that is no doubt helped along by their efforts to speculate and buy as much of it as possible. Ergo, Sam's Club and Costco are limiting customers to how many 20-POUND BAGS customers can buy in one trip. If that's rationing, people in World War II should be so lucky. The Old Farmer's Almanac, keeper of rural knowledge and earthly facts, passed along a recipe that reminded me of one I'd had in England many years ago. Certainly more years ago than I'd care to account for. Tart rhubarb and apples, sweetened and spiced and topped with oatmeal crunch, make an easy dessert. Mix together flour, oats, brown sugar, spices, and melted butter. Press half of the mixture into the bottom of a 9-inch square baking pan. Arrange the rhubarb and apples evenly on top. Cook the white sugar, water, cornstarch, and vanilla until thick; pour over the rhubarb and apples. Sprinkle the remaining oatmeal mixture on top. Bake at 350 degrees F for 1 hour. Serve warm with ice cream or whipped cream. The new issue of Southern Living has a spread on buttermilk -- that most Southern of all ingredients. What else can be used in everything from biscuits to fried chicken to banana bread adn salad dressing? It is a new dish-cleaning productthat could very well make scouring and scrubbing of pots and pans a thing of the past. Magic Sheets is a biodegradable sheet infused with a proprietary organic blend that helps pull the food and debris away from the surface of pans and dishes. When left to soak in even the greasiest and dirtiest cookware anddishes, Magic Sheets loosens the grime and food particlesthereby eliminating the need for lengthy soaking and strenuousscour pad work. Magic Sheets are completely organic, nontoxic and will biodegrade in 21 days. Although initiallydesigned for the home-use market, Magic Sheets are also idealfor cleaning grimy BBQ grills and are equally useful for thecommercial kitchen/restaurant market. Instead of soaking the dirty pan overnight, simplywet the sheet wipe the item, fill the pan with water, drop aMagic Sheet in the center and continue to clean the rest of thedishes. After just 15 minutes or so all of the debris will havebeen loosened from the surface, much of it latched on to theMagic Sheet. The composition of the sheet is such that it literally pulls the debris away from the pan’s surface. Simply dispose of the debris-covered sheet and use a basic sponge and a few drops of dish soap to finish cleaning the dish without the need of scrubbing and scouring. Happy Earth Day, to you. Few things are more in tune with Mother Nature than what we eat. Here’s a twist on eco-friendly disposable plates: Palm Leaf Dinnerware. The plates are made from naturally discarded palm tree sheaths and are bio-degradable, meaning they can be thrown away or composted after use. Described as “stylish, yet rustic,” the dinnerware comes in several shapes and sizes and is available online from Marx Foods. Every piece is unique and the line includes bowls, plates, serving dishes and utensils. Each order contains 25 pieces, or picnic and dinner party themed setting combinations are also available. Ideal for occasions ranging from backyard barbeques to formal affairs, Palm Leaf plates are easy, yet elegant enough for multi-course, sit down dinners. HOW ARE THE PLATES MADE? Freshly fallen, naturally discarded sheaths of the leaves of the Adaka Palm tree are collected. Each raw sheath is initially rinsed with water and then hand washed in a natural mixture of water and tumeric. The leaves are then rinsed a third time in pure water. Once clean, the palm sheaths naturally air dry. The leaves are then hand stretched and flattened. Various plate profiles, including round, square and hexagon-shaped dinner plates, are molded using a heated press. One to three plates (or more, depending on size) can be created from each leaf. In order to maximize the surface area of each sheath, different dinnerware sizes or shapes may be cut from one leaf. Once clean and cut, each plate is sun-dried and packaged in groups of 25. Just in today: a cache of four packets of Funky Monkey Snacks, billed as The Fruit That Crunches. Flavors tasted: bananamon, Carnaval Mix, Jivealime, and Purple Funk. Testing group: six adults, one 12-year-old middle school student. The split: Adults were split 3 for and 3 not-so-for. On the 'pro' side: crunchy, no sugar added, makes some softer-textured fruit more palatable for folks who have texture issues. On the 'con' side: odd smell upon opening the packet, bit of an aftertaste. Texture was odd, due to the freeze-drying. The tie vote went to the target demographic: the 12-year-old. He liked it and munched away on Carnaval Mix. His vote trumps the grownups. The skinny: These are 100 percent natural, no sugar or fat added. Because they're freeze dried, they retain all of the original fruit's nutrients, some of which can be lost or damaged in traditional drying. No colors or preservatives are added either. They are gluten free, dairy free, wheat-free and certified Kosher. The packets have a good bit of snack in them, and this would be handier to have in the van than, say, a whole bunch of tropical fruit. Retail prices is around $2 per pack. Available online or at Whole Foods in Mountain Brook. Coming in tomorrow's Your Table, we're reviewing two grilling cookbooks written by women -- and that cover the gamut of outdoor entertaining. We've also got some homemade pasta by Prudence Hilburn, a fool-proof muffin recipe, some cooking ideas for kids headed off to college in the fall and a guide to the hot wines of our time. Seismic sounds, fiery flavors, an array of vibrant colors, exotic fruits and vegetables- these trademarks of Caribbean culture are as diverse as the islands that make up the Caribbean. From Jamaica and Haiti to Cuba and Puerto Rico, the Caribbean culture is a fusion of high energy,colorful music, customs, and foods. In acknowledgement of this rich culture, Lawry's yearlong Cooking Up Culture program proudly celebrates the influence of Caribbean cuisine on American dishes,and just in time to celebrate the 2nd annual Caribbean-American Heritage Month in the U.S.
"Caribbean cuisine is one of the most flavorful and festive cuisines that we love here in America," says Lawry's spokesperson B. Smith. "With a mélange of cultural influences from Spain, France, India and Africa, and even Mexico, Caribbean foods marry tropical flavors with delicious spices to create unique and exciting dishes. That's why America has been known to celebrate Caribbean cuisine, whether through take-out jerk chicken restaurants or more upscale, sit-down establishments that offer Caribbean fare." The foods of the Caribbean are marked by a wide variety of fruits, vegetables, meats, grains, and spices, all of which contribute to the area's unique cuisine. European colonists, including the Portuguese, Dutch, Danish, British, French and the Swedes, brought oranges, limes, mangoes, rice and coffee to the Caribbean. They also introduced sugarcane, which was later fermented to make rum, a drink that remains the ultimate tropical Caribbean beverage. Spaniards introduced other foods, notably coconut, chick-peas, cilantro, eggplant, onions, and garlic. West Africans introduced okra, pigeon peas, plantains, callaloo, taro, breadfruit and ackee. Mexico's donations include papaya, avocado, chayote, and cocoa. In addition, laborers from India and China came to work in the fields and plantations of the Caribbean, adding two very different culinary influences to the already robust melting pot of Caribbean flavors. Since many of the Caribbean islands had wild pigs and cattle, spiced and smoked meats became an integral part of the people's diet, the most popular being jerk meat. Many of the foods and spices from the Caribbean's island cooking have been exported to other continents around the world, becoming a familiar mainstay in many kitchens. Try these easy-to-make, Caribbean-inspired recipes during your next family meal. These, and other Caribbean recipes, are available through the end of April. 1 medium tomato, chopped1/2 cup chopped red onion1 tsp. Lawry's® Garlic Salto In small bowl, combine Chile & Lime Marinade With Lime Juice with cilantro; set aside.o In large resealable plastic bag, pour 1/2 cup marinade mixture over steak; turn to coat. Close bag and marinate in refrigerator 30 minutes. Reserve remaining marinade mixture. Remove steak from marinade, discarding marinade. Grill or broil steak, turning once and brushing with 2 tablespoons reserved marinade mixture, 10 minutes or until desired doneness.o Meanwhile, in large bowl, toss remaining reserved marinade mixture with remaining ingredients. Chill, if desired. To serve, top steak with salsa. 1/2 lb. uncooked large shrimp, peeled and deveined. In large stock pot, heat Olive Oil over medium heat and cook boniato, bell pepper and onion, stirring occasionally, 5 minutes or until vegetables are tender and boniato is starting to stick to pan. Add tomato paste and cook, stirring frequently, 2 minutes, then add seafood broth and Caribbean Jerk Marinade With Papaya Juice. Bring to a boil over high heat. Reduce heat and simmer, covered, 25 minutes or until boniatos are tender. Add remaining ingredients and simmer, covered, an additional 5 minutes or until fish is done and clams open. Garnish, if desired, with chopped fresh cilantro. 8 corn or flour tortillas, heated according to package directions. 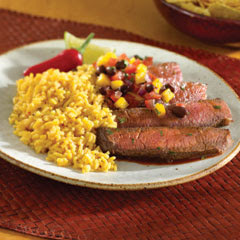 In large resealable plastic bag, pour 1/2 cup Mexican Chile & Lime Marinade With Lime Juice over fillets; turn to coat. Close bag and marinate in refrigerator 15 minutes. Meanwhile, in small bowl, combine sour cream with 2 tablespoons Marinade. In another bowl, mash avocado with Garlic Salt; cover and chill until ready to serve. Remove fillets from Marinade, discarding Marinade. Grill or broil fillets, turning once and brushing with remaining 2 tablespoons Marinade, 6 minutes or until fillets flake with a fork.o To serve, evenly spread avocado mixture on tortillas, then top with fillets and sour cream mixture. Garnish, if desired, with salsa, shredded Mexican blend cheese and/or shredded cabbage. 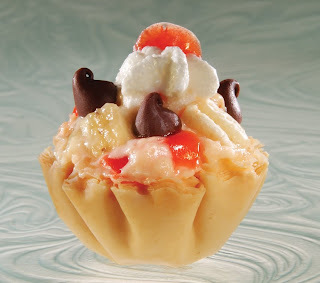 These sweet snacks make perfect take-along treats to any NASCAR party. The cute, crowd-pleasing race cars can be made ahead and stored, or created right before – either way with super-fast prep and even quicker clean-up, you’ll have plenty of time to enjoy every last lap of the Aaron’s 499 at Talladega! Combine sugar and whipping cream, stirring with a whisk until smooth. Cut 3 Marshmallow Treats in half, crosswise. Spread a thin layer of frosting mixture on each Marshmallow Treat half; place each half, frosting side down, in the center of each of the remaining 6 whole Marshmallow Treats, pressing gently into place. Let stand 5 minutes or until set. Turn race cars on their sides. Slice the Swiss Cake Rolls ¼-inch thick, making enough slices for 32 wheels. Slice a few extras, as well, in case they are needed. Spread a small amount of frosting mixture in the center of each of 16 of the slices of Swiss Cake Rolls. Press 2 slices gently onto one side of each race car to create wheels. Let stand 15 minutes or until set. Turn race cars over; repeat with frosting and remaining 16 slices of Swiss Cake Rolls. Spread a small amount of frosting on hard cinnamon candies; place 2 candies on each car’s “nose” to form 2 headlights each. Spread a small amount of frosting on flat sides of each jellybean candy; place 1 jellybean on the front of each car to form a “grill.” Let stand 15 minutes or until set. May be stored in an airtight container for 1–2 days if not served immediately. Whole Foods Market, the world’s biggest natural and organic foods supermarket, is celebrating Earth Month and the stores’ elimination of plastic grocery bags on Earth Day by donating 10 cents for every reusable grocery bag that customers bring in on April 22 to Alabama Rivers Alliance, a non-profit organization created to protect and restore state rivers through water quality and quantity policy advocacy, restoration planning, grassroots organizing, and watershed education in order to achieve clean and healthy watershed ecosystems, healthy people, strong economies, and a functioning democratic system of government in Alabama. The Company announced in January that it would end the use of disposable plastic grocery bags at the checkouts in all of its 270 stores in the U.S., Canada and the U.K. to be plastic bag-free by Earth Day, April 22. The first U.S. supermarket to commit to completely eliminating disposable plastic grocery bags to help protect the environment and conserve resources, Whole Foods Market has encouraged shoppers to bring their own bags for years by offering a refund of either five cents at the checkout, but upped the ante to 10 cents when they made the bag free announcement. Now, in celebration, the stores are hoping to inspire shoppers to adopt a reusable mindset as well by donating these refunds to a local green charity. On April 22, all Whole Foods Market Team Members will also be participating in a “green out” to celebrate the stores’ “bag out” by donning green attire in honor of Earth Day. Beginning in January, each store in the company began depleting stocks of disposable plastic grocery bags and raised awareness about the benefits of reusable bags. Over the past three months, stores have reduced plastic grocery bag inventories and increased selections of reusable bags for purchase. Whole Foods Market sells different types of reusable bags, ranging from canvas to its new large, stylish “A Better Bag” — a sound environmental choice since 80 percent of its content comes from recycled plastic bottles and it is an economical choice as well since it costs only 99 cents. Discontinuing disposable plastic grocery bags at the checkouts is another step in the Company’s ongoing effort to provide more Earth-friendly bags and containers in its stores.. Additionally, the Company continues to seek alternatives to plastic bags in its bulk, produce, bakery and seafood departments. A lot of time is wasted in my kitchen by rooting through my spice cabinet. It gets even worse if the spousal unit decides to get in there and do some rooting of his own. The SpiceStack fits inside the kitchen cabinet. 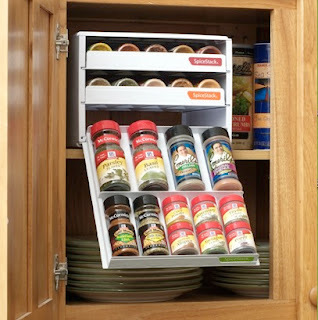 Three pull-out, drop-down drawers organize spice bottles horizontally so the labels can be visible. To use, slide the drawer out until it’s fully extended, then lower the drawer to resting position, where it’s easy to identify, retrieve and restock spices at eye level. The unit, which measures 11 inches wide, 10 3/4 inches deep and 8 inches tall, comes in white. It holds up to 27 full-size or 54 half-size round spice bottles, or any combination of the two size bottles. Spices can be stored in the drawers alphabetically, by frequency of use, or by type of cooking. Four non-skid pads on the bottom of the unit hold it securely in place inside the cabinet. The SpiceStack requires no assembly (that part’s important) and is made of plastic. The SpiceStack is manufactured in the United States. Cost is $29.95, plus shipping and handling. Order now and receive up to 3 additional units for $14.95 each, plus shipping and handling, along with a complementary cooking apron for each unit ordered. Empty bottles with front and purchase date labels are also available. You can order online, visit or call 866-247-9459. Last year, 17.4 million new grills were shipped and 95 percent of Americans fired up their grills, according to the Hearth, Patio and Barbecue Association – showing that people are invested in their outdoor cooking skills. While most people are bent toward a carnivorous palate, the fire is the perfect way to cook mushrooms. They’re low-cal, high in Vitamin D and quickly prepared on a spring or summer eveing. Vitamin D Dilemma: Although people are out in the sunshine in the spring and summer, only 10 percent of Americans have optimal levels of vitamin D, according to a journal in the American Heart Association. Whether you’re using sunblock or are one of the 34 million Americans who have office jobs, almost everyone needs more vitamin D. Mushrooms are the only fruit or veggie that naturally contains vitamin D, so toss some in your favorite summer salad, like the “Farmers Market Salad,” for a D-licious meal. Fresh Superfoods: Did you know that mushrooms have the same amount of potassium as a small banana? Or that mushrooms have an antioxidant capacity similar to brightly colored vegetables? Not only are they nutrient-rich, mushrooms have umami, an elusive fifth flavor, making them a superfood for taste and nutrition. Heat two tablespoons olive oil in large non-stick skillet over medium-high heat. Add a single layer of mushrooms and cook, without stirring, for about five minutes or until mushrooms become red-brown on one side. Flip and cook about five minutes more, until other side is same color; set aside. Sauté zucchini for about five minutes, adding additional olive oil to skillet if necessary. Turn off heat and add corn and rice; stir to combine. Cook for an additional three to five minutes to warm ingredients. Drizzle with remaining olive oil and lemon juice and gently stir in bell pepper and thyme; season with salt and pepper. 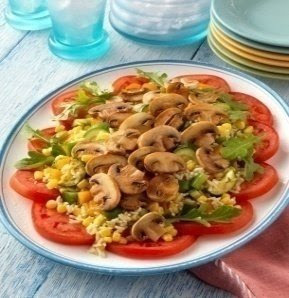 Arrange tomatoes and arugula on a plate; pour on rice mixture and top with mushrooms. May be served warm or cold. Wish together oil, salt and pepper and brush mushroom strips and red peppers with mixture. Place red pepper pieces on a skewer and grill peppers and mushrooms, turning once, for about 10 minutes. Toss lettuce with vinaigrette and arrange on a shallow serving platter. 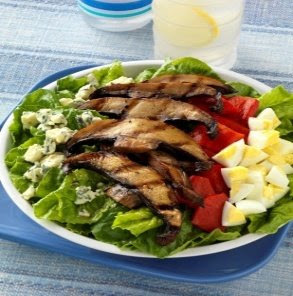 Arrange mushrooms, roasted peppers, eggs and blue cheese in four “stripes” across the bed of lettuce. Serve chilled. Preheat grill. While grill heats, boil water and blanch potato cubes for 5 minutes, then cut in half and set aside. In a large mixing bowl, whisk together oil, vinegar, mustard, rosemary and salt. Add mushrooms, potatoes and pepper pieces and toss to coat, then skewer individually, to create four skewers of each ingredient. 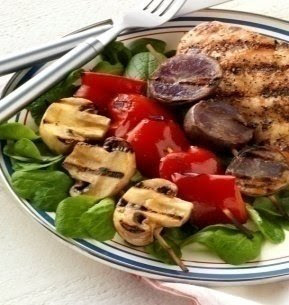 Reserve the remaining marinade and grill vegetables until tender, turning once, about five to 10 minutes total. Split lettuce between four plates and place one of each skewer on top; drizzle with reserved marinade and serve either warm or cold. Star Staff Writer Andy Johns is a certified Kansas City Barbecue Society judge. He's frequently seen haunting barbecue joints, and in today's Your Table, he lets us know which way the smoke blows. Summing up the all the barbecue joints in east Alabama is like asking the Michelin Man to write a column on tires: They may all look the same to the untrained eye, but there are plenty of differences if you know what you are talking about. And like tires, it takes a little driving to appreciate all of the differences. Being the intrepid reporter that I am, I always like to schedule my interviews in around barbecue joints. I've interviewed a coroner at Goal Post Bar-B-Q (order the pork sandwich but save room for peanut butter pie); a police chief at Jon Boy's Smokehouse in Roanoke (go for pulled pork and baked beans); a fire chief and sheriff at Marie's Bar-B-Que House in Heflin (pork sandwich is the best around but ribs disappointed me); and a commissioner at Partner's Pit BBQ in Lineville (I'll put their twangy red sauce on anything and have heard they have good stew). In other travels, I've visited the Choo-Choo Bar-B-Que in Wedowee (good St. Louis-style ribs); Brad's Bar-B-Q in Oxford (pork was too sweet for my taste); The Rocket in Jacksonville (average pork, good atmosphere); Cooter Brown's Rib Shack (better ribs than Dreamland … there I said it); and Golden Rule Bar-B-Q in Oxford (step out of the Alabama box and try the beef brisket). Any where I go Dad's Bar-B-Q on McClellan Boulevard is almost always on the way to or from work at The Star, and they always have good, cheap pork sandwiches, fries and sweet tea ready to hand out the drive-thru window. On a slower-paced day, I love going into the restaurants and letting the hickory smoke and décor make a lunch break really feel like a break. High school jerseys on the wall are good for school spirit, but I like the restaurants that have more unique features. Dad's on McClellan has the telephones on the table you use to order. Partner's has tons of old pictures and tools on the wood panel walls. Golden Rule has a few seats at the bar where you can see right in to the pit. Goal Post on Quintard wins points with me for the neon sign of the kicker booting a football. But for my money, there's no better place than Ron's Bar-B-Q in Alexandria. Barbecue judges know that a lot of restaurants over-cook their pork trying to make it tender. If you pinch some of your pulled pork between your thumb and forefinger, it should maintain its shape when you open your fingers. If the pork turns to unrecognizable gray mush, it is over cooked. Mush-syndrome is more common than you might think. Ron's pork stands up to the test, and anytime I can schedule a work assignment out on U.S. 431 I try to make a stop. The sauce at Ron's compliments the meat without covering it up, and the onion rings, fries and bake beans make it feel like a meal. During the fall, winter and early spring, Ron's is an even better place because that is "stew weather." For about seven months a year, Ron's has the best Brunswick stew you can find. You might as well finish reading the paper instead of rushing off to try it because they're already done with it this year. Don't like my choices? Fine with me. You could make an argument for almost any place, though arguments with samples are preferred. I haven't hit them all yet, so there may be gems I haven't found. A light, springtime favorite that goes together easily. These peas are as far away from the school cafeteria "Army men" as you can get. If you use fresh peas, they'll need to simmer longer in more chicken stock. 1/2 teaspoon dried Italian seasoning. In a saucepan, bring the chicken broth, ham and Italian seasoning to a simmer and let the herbs steep a minute or two. Add the peas, salt, pepper and butter. Cover the pan and let the peas simmer and steam a few minutes until they're just done. Don't overcook them, because they were cooked quite a bit before they were frozen. They should still be firm and a beautiful bright green.If you use freshly shelled peas, simmer them, covered, along with the herbs and ham for about 8 minutes, then check to see if they're done. Putting together a food section is hard on the salivary glands. One picture in particular — of Basque-style chicken — got me going. As I scanned the recipe for ease of prep (we do this, you know, 'cause if we wouldn't cook it, neither will you), I stumbled upon an unfamiliar ingredient ... Espelette pepper. Staring at that picture, I really wanted to share the recipe. So I began the research. Short story: Espelette pepper is ground chile named for a village in France. Lucky for us, we can substitute hot paprika in the recipe. Disaster averted. Also in YOUR TABLE: Easy rice casseroles, beer selections for the hard-working, an ode to lard and a scone story with a recipe to customize. Happy eating. One of the habits I like to encourage is taking children to the grocery -- not because we moms have to, but because they can be such fun experiences. Now, I'm not talking about a rushed trip when there's nine million things to buy and it's been a long day; I'm not crazy, after all. But every now and then, it's fun to go to the store just for the sake of taking a look around. The children are relaxed, you're not on a mission to buy and get out as quickly as possible. It's an opportunity for fun, and we have to capture those whenever we can. This past Saturday found us at the seafood counter. We're becoming more conscious of where our food comes from, so we picked two of the items of U.S. origin: shrimp and catfish. Both are favorites in our house. The shrimp were destined for a bath of tequila, garlic, olive oil and finely chopped cilantro from the back yard. No, there was no salt in this marinade, nor any pepper. The shrimp looked great, and didn't need any additional help, other than this marinade that's really much milder in result than its ingredients list would hint at. I peeled, deveined them and set them in this marinade about 30 minutes before cooking time. At the same time, I put some small red potatoes in the microwave to steam. The catfish was rubbed with a Cajun-style mix of seasonings (buy ready-made if you don't have an overflowing spice cabinet). The shrimp was skewered; my cast-iron griddle was set on the grill to heat for about 10 minutes until it was smokin' hot. The cooked potatoes were seasoned with salt, pepper, some olive oil and little leftover cilantro; they went on an aluminum pie plate that had some holes poked in the bottom and were popped on the top rack of the grill, but not directly over the skillet or fire. When blackening fish, it's important to have a hot, heavy griddle or skillet. Once the fish is down DO NOT MOVE IT until you're ready to flip three minutes later. Exactly three minutes, then flip with a wide spatula. A fork will not work and will only break up your fish. Three more minutes, and it'll be done. Six minutes per inch for fish. It will continue cooking after it comes off the grill, so don't overcook it. In that six minutes, you're potatoes (stuck on the top grate) should be nicely wreathed in smoky flavor. Your shrimp (offset to a cooler part of the grill and flipped once or twice) should be just cooked AND NOT OVER-COOKED. Squirt them with some lemon juice as they grill. Dinner done with little prep, very little mess and flash-cooked on the fire. Do I hear a margarita calling? I suppose it's a good thing I'm not a stay-at-home mom or my family would be the size of the Dallas Cowboys offensive line. During the workweek, dinner rarely gets more than 30 minutes' attention after we get home from work/school. I've either got a cache of dishes done and stashed in the freezer, or an assembled dinner waiting for us or in the 'fridge ready for the oven, or the Crock-pot is on the job. As a result, I wouldn't say we ever have anything special for dinner during the week. Cooking a full dinner from start to finish the same day we eat it -- that's a rare treat. To accompany the meat, some whole carrots were slowly pan "roasted" in a covered skillet on top of the stove in a bit of olive oil, some salt, pepper and thyme. Right before dinner, some frozen peas were added and cooked just enough to be done. Naturally, there were mashed potatoes involved. Capped off by a piece of freshly made herb bread (another post). Good stuff. No leftovers. Tonight we're having a salad. Spring Break kicked off yesterday in our house. A day off means that the afternoon will be spent cooking in the kitchen. Anyway.... our experimenting afternoon found us in the land of bread. We're in the midst of an herb kick, and the recipe on hand was a nice, whole wheat bread blended with herbs fresh from the garden and a chunk from a red onion that had been sitting on the counter minding its own business. Out comes the "big mixer," as it's named by the two younger cooks. It's a professional-grade stand mixer that has made whipping up a batch of yeast bread easier than ever imagined by our foremothers, who kneaded for days. The dough hook makes short work of blending and kneading. Because I "bloom" the yeast in the mixer's bowl, then toss in all the other ingredients, this only dirties up one vessel. Another bowl is oiled for the rising process. Wonderfully easy, this recipe uses a mix of whole wheat and unbleached flour. In a large mixing bowl (or the bowl of your stand mixer) mix 2 teaspoons sugar, 1 packet of instant yeast and 2 cups of really warm water. (The water has to be hot enough to activate the yeast, so shoot for 105 degrees). Let bloom for 10 minutes while you chop any herbs you want to include. To the mixing bowl, 1 teaspoon salt and 2 tablespoons olive oil or vegetable oil. Mix. Add 2 cups whole wheat flour and 1 cup unbleached flour. Start mixing on low. It will form a wet, sticky dough. You'll probably need to add about 1 more cup additional flour during the mixing process to get the dough to a state that's smooth and elastic. (If you've got a dough hook on your mixer, that process comes when it starts to "climb" up the hook.) Allow the dough hook to knead the bread about 5 minutes. If you're kneading by hand on a floured board, work the dough about 10 minutes. Put the dough in a large, oiled bowl and turn to coat the dough in oil. This keeps the surface from getting dry and crusty. Cover the bowl with a damp dishtowel and let rise in a warm place until doubled in volume, about 90 minutes. Punch down the dough, then form it into a loaf. Put in a greased loaf pan, cover with a towel, then let it "proof" for 30 minutes before baking in a 350-degree oven. Bake about 45 minutes to an hour, then remove to cool completely before slicing. The top will feel hard when you take it out of the oven, but as steam rises through the bread, it softens the crust. Cutting while the bread is still hot will leave you with a goopy mess, so be patient and let it cool.